Subjects: Sally teaches personal finance, American history, economics, business education and social studies. Some of her classes provide dual credit as Missouri State University. In addition, she serves as an advisor for the Future Business Leaders of America and the school’s student council. Why Teaching: Sally said, “it seems I’ve always been teaching – just not always in a formal classroom environment.” Previously, in corporate America, Sally would make sure to teach and train those around her – whether on a new computer program or department processes. So, while Sally has “only” been a professional educator for 18 years, it’s actually her second career. For about a dozen years prior she worked for a large bank in Kansas City doing quality control for trust operations. In that position, she said she consistently encountered misconceptions about financial concepts and processes and thought “maybe I can make a difference if I could inform folks a little earlier in their lives.” That’s when she decided to become a teacher. Why Personal Finance: Sally shared that while some of her passion for teaching personal finance came from working at the bank, she also said she thinks some of the messages people receive about financial success are off base. State Financial Education Requirement: To graduate from high school, Missouri students must earn a 1/2 credit in the area of personal finance. 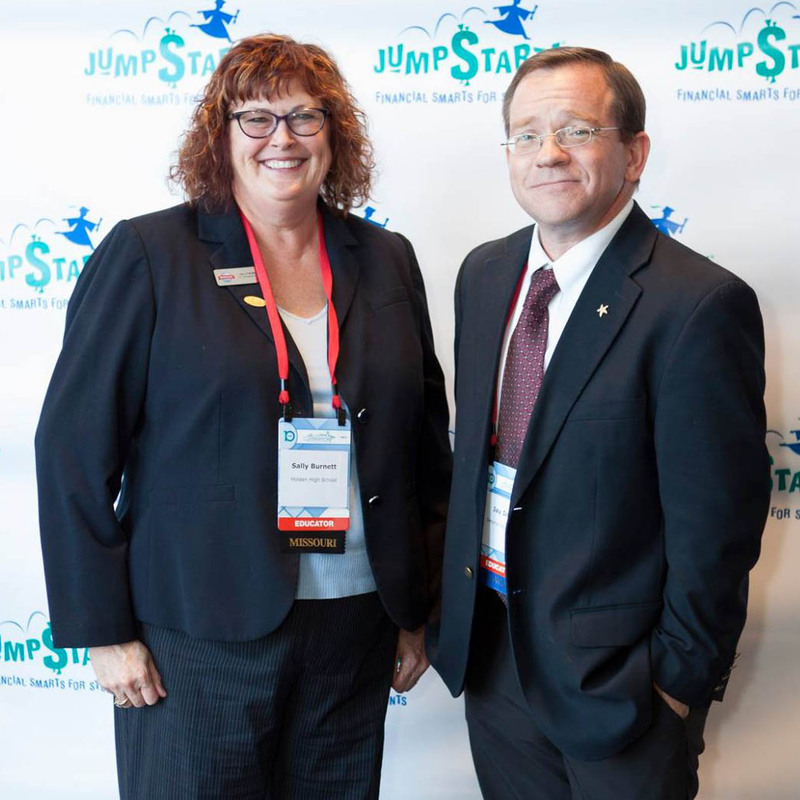 Sally, said one of the things she was shocked to learn at her first Jump$tart National Educator Conference (NEC) was that personal finance wasn’t a graduation requirement across the United States. She also said Missouri is moving forward with ways to improve personal finance education. She noted that she and a group of colleagues from across the state wrote and refined performance measures, and they worked with a testing company to perform a content and bias review of test questions for an end-of-course exam. Resources: In terms of resources, Sally, shared that NEC provided numerous opportunities for her to connect with others who are “in the thick of it.” She also said she ditched the personal finance textbook a few years ago to take advantage of the breadth of available resources. She also said what has been remarkable about all of the resources is the customer service. Whether she or a student reaches out for assistance, typically within 24-48 hours they have an answer. In addition, she often sees changes in the tool based on their questions or feedback in the years that follow. Editor’s note: Sally asked that we include the following: “I am extremely grateful to the generosity of the Jump$tart Coalition. I would not have been able to attend the National Educator Conference without a scholarship. While – in textbooks – “soft skills” may technically not be a part of the personal finance curriculum, they are part of Sally’s lessons. For her, there is so much focus on standardized testing and gaining hard skills, that Sally wants to ensure her students leave the classroom ready for the workforce – beyond what they learn from textbooks. She also wants to instill in them an ability to make good financial choices. Then they move to the more tangible aspects of personal finance. They learn to analyze bank statements and discuss debt, the stock market, career choices and more. For each of these lessons, her students have an opportunity to work individually or in groups to create class presentations. It’s how Sally intertwines those soft skills, personal finance and business. She wants her students not only to navigate the labyrinth of personal finance choices they will have but also to understand the often unspoken language and behaviors of the business world. One of the unique aspects that Sally brings to the classroom is her background in social studies. For Sally, it’s her combined knowledge of history and economics that guide her personal finance lessons. This “economic way of thinking” helps students understand what factors impact economic growth and downturns, why and how legislation is created, and the potential benefits and pitfalls of regulation – all of which impact not only her students’ understanding of history but also (and perhaps more importantly) how to make good choices in prevailing economic conditions. Two other key components of her course are the SIFMA Foundation’s Stock Market Game and H&R Block’s Budget Challenge. She likes that her students can reflect on personal performance and analyze what they could have done differently – and how and if their financial philosophy should change or is impacted. H&R Block’s Budget Challenge, Sally said, “brilliantly teaches the lesson – if you do not pay your bills on time, your credit score will take a hit.” It also provides an opportunity to use a spreadsheet to track income and expenses, which she likes to remind her students is a highly marketable skill. All of Sally’s efforts seem to be working and reinforcing her lesson to students that there are many paths to financial security. She said most of her students walk away from her class understanding the value of investing in their human capital, be it vocational education, internship or higher education, to improve their marketability and earning potential – and thus their financial security no matter the path they take.